Looking for a Gordon Setter? The Gordon Setter originated from Scotland. The striking, compact breed is the most alert, stoic, and sensible of the setter breed, also the largest. It weighs 45 to 80 pounds and stands 58 to 69 centimetres at the withers. It is an agile yet powerful dog that loves to engage in rigorous activities such as hiking, running, jogging, and field work as exercise. It is incredibly affectionate and thrives for the attention of its family. Here is the complete background information of this active dog breed. The Gordon Setter is a sporting breed named after the Duke of Gordon of the Gordon Castle located close to Fochabers in Moray, Scotland. Originally referred to as the Black and Tan Setting Dogs in the 1600s, it did not receive attention until 200 years later when the Duke of Gordon introduced the breed to his kennels. Records suggest that the Duke highly-prized the Gordon Setter's stamina as it can work from dusk till dawn and rarely makes a "false point" during a bird game. In 1827, the Duke of Gordon passed away, and his son carried on with the tradition of having Gordon Setters in his kennels. It was in the mid to late 1800s that the first Gordon Setters were registered with The Kennel Club. The then called Black and Tan Setter took part in dog shows and won first prize for setters. It was only in 1924 when this dog breed was given its name in honour to the late Duke of Gordon. Today, the Gordon Setter is recognised by international kennel clubs and is currently listed as a vulnerable native breed due to the low number of puppies registered annually. Handsome and proud, the Gordon setter is the largest among the setter breeds, weighing 45 to 80 pounds and standing 58 to 69 centimetres at the withers. It sports an attractive shiny coat, which is considered one of its beautiful features. The Gordon Setter has a head that is deep than it is broad, dome-shaped skulls, well-defined stops with wide, and long muzzles. The breed also has nicely defined lips, a black nose that is broad and large with wide nostrils. With dark brown eyes, the Gordon Setter boasts of a gentle and intelligent expression. Its ears are moderate in size, set low and lie flat on its head. It carries itself proud and noble with its long and lean arched necks. This breed has a nice compact body that is moderately long with a level topline. The Gordon Setter has an attractive coat that is soft and shiny that may be straight or wavy. It wears long hair (feathering) on its ears, chest, belly, and back of legs. Tails have thicker feathering at the base but tapering to a fine point as it reaches the tip. Accepted breed colour is only the classic black and tan colour, with some tan markings in rich chestnut or mahogany colour on its muzzle, eyes, throat, chest, hind legs and forelegs. 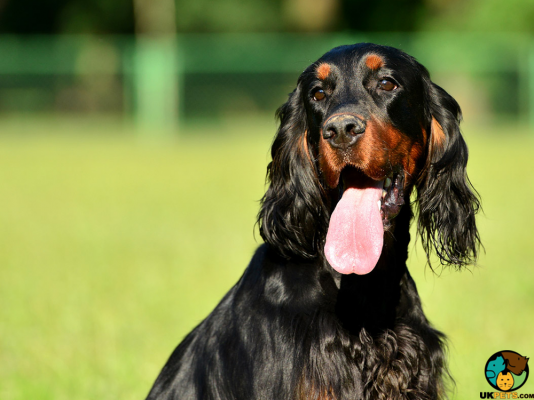 However, the Gordon Setter can be seen in other coat colours such as black, tan and white, liver and tan or solid red, albeit not acceptable in the breed standard. The Gordon Setter is a moderate shedder, so brushing and combing its coat two to three times a week will prevent or remove tangles and mats, dead hair and will distribute skin oils on its coat. Also, make sure to trim the hairs at the bottom of its feet and between the toes. Gordon Setters have alert, playful and agreeable characters. They are quiet and dignified but at the same time clownish and demanding. This dog breed is extremely loyal to its family but wary and aloof with strangers. Both dispositions make them excellent watchdogs. Gordon Setters should never be shy or aggressive toward people. 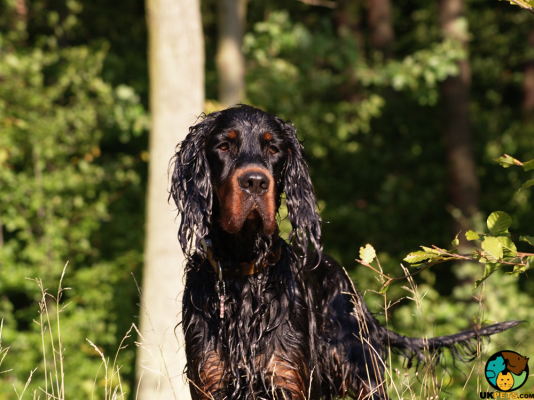 The Gordon Setter is calm and well-behaved in the house, but when it's in the field, this breed transforms into an alert, fearless and capable hunting dog. Although Gordons aren't fast, they make up for it with their tireless stamina. This Gordon is intelligent and moderately trainable. However, its strong-mindedness will call for an early training by someone with a steady hand who knows how to stick to rules, patient and persuasive. Gordon Setters do not respond well to harsh handling. With children, an adult Gordon Setter is a gentle companion and a good friend and playmate. It knows when to walk away when it deems playtime to be too rambunctious. However, a young Gordon Setter may not do the same and is not the best choice for families with a toddler. Then again, supervision is a must during play to avoid any mishaps. When it comes to other pets, the Gordon Setter gets on well with other dogs and household pets that were raised with it. However, this dog may exhibit aggression to other dogs and will consider smaller animals outside of its household as fair game, so care needs to be taken. Also, the Gordon's hunting instinct makes it prone to wander especially when following a scent. With this said, this dog breed should not be allowed to roam freely unsupervised. A typical serving for an adult Gordon Setter is 2 to 3 cups of quality dry dog food per day. Nutrition is one of the biggest factors contributing to its overall health, so make sure you know what and when to feed your dog. If you are not sure about its nutritional requirement, do not hesitate to consult a veterinarian or a canine nutritionist for a recommendation. Gordon Setters will require a high-protein diet for muscle growth. Brown rice, mixed with vegetables is also a highly recommended home-cooked diet. On the other hand, wheat, corn and other natural food fillers must be avoided. When given proper diet, exercise and love, Gordon Setters can live out its maximum lifespan of 12 years. However, like all dogs, they are predisposed to genetic health issues. These health issues include Hip Dysplasia, Progressive Retinal Atrophy, Hypothyroidism, Bloat and some eye problems. 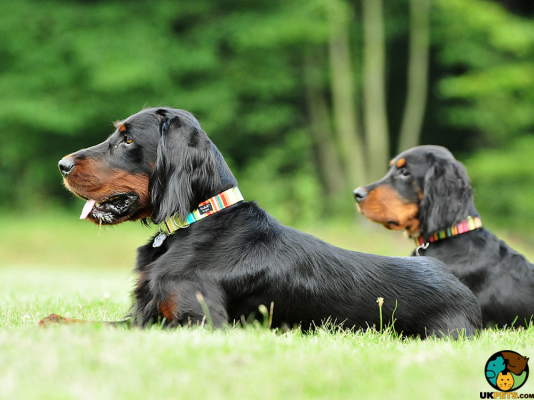 The Gordon Setter is a sporting breed, which means they feel more at home outdoors where they can work. With this said, this dog will require plenty of exercises and mental stimulation to make it happy. Gordons especially love to engage in rigorous activities such as hiking, running, jogging, and some field/hunting work. When you decided to buy a Gordon Setter puppy, make sure you are ready financially. This means that apart from paying the price to buy the puppy, you can actually afford to raise it along with all the things it will need to be a well-fed, happy and healthy dog. Why don't we go through a few costs to factor in? This way you can roughly estimate how much a Gordon Setter will cost you overall. The Gordon Setter puppy price does not go below £900 for a well-bred pedigree. Unfortunately, even if you have the money to purchase it now, you will have to go on a waitlist as only a few puppies are bred and registered each year. On the flip side, this will give you ample time to save for other costs that include pet insurance which is anywhere from £25 to £65 a month. You will have to prepare at least £1,000 good for a year of veterinary consultations. On top of that, set aside a budget to buy high-quality dog food which is about £50 to £60 a month, considering the Gordon is a large canine breed. Overall, a rough estimate will be around £80 to £130 a month, excluding the initial purchase and will depend on the level of insurance coverage you avail. 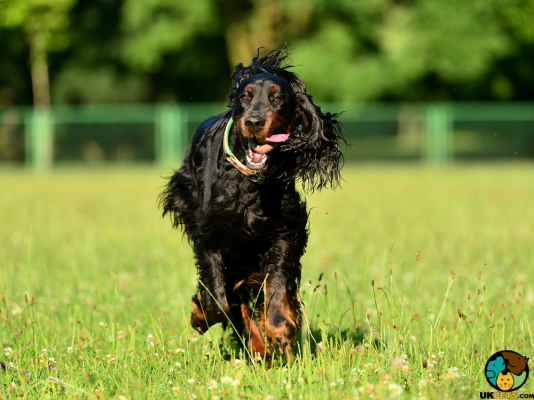 Is a Gordon Setter Right for You? The Gordon Setter has an alert, playful and agreeable disposition. It is a moderate shedder, so brushing at least twice a week is a must. It is intelligent and moderately trainable. Gordons love to engage in rigorous activities such as hiking, running, jogging, and some field/hunting work. Acceptable coat colour is black and tan only.